So you lost an important file. Ouch. If you simply deleted the wrong file, you can usually get it back by opening the Recycle Bin (on Windows) and restoring it. On a Mac, you'll look in the Trash Bin. Linux users, check the Trash folder. The happy secret here is that in most cases, deleted files really aren't gone at all. They're just moved into the Recycle/Trash bucket, and can be restored to their original folders with a few clicks. But if that doesn't do the trick, try one of these free tools to do the heavy lifting. Read on and you'll find a crop of tools to recover deleted files. Piriform's Recuva (pronounced like "recover" with a Brooklyn accent) will help you to find files and images on your Windows computer that were deleted by human error, including those deleted from your digital camera memory card or MP3 player. Recuva can also restore files deleted from the recycle bin or those that were deleted by a bug, virus or crash. This is a free Windows application that includes a support forum and because it is a freebie, Piriform would appreciate a small donation if you like their software. Recuva comes from the same people that developed the popular CCleaner, so the reputation is rock solid. PhotoRec is a free undelete utility for Windows, Linux and Mac OS X. Despite the name, it can recover almost 400 different file formats (not just photos) including ZIP, Office (Word/Excel/Powerpoint), PDF, HTML, TXT, and JPEG. Photorec can recover files from a variety of media, including hard drives, CD/DVDs, digital camera memory cards, and USB flash drives. It can also be used with portable devices (including the iPod) and many digital cameras. Photorec doesn't even require that the drive be partitioned, formatted or mounted with a drive letter. GlarySoft is a trusted source for free utility programs, and Glary Undelete is another file recovery program worth a look. It's easy to use, yet powerful, with support for all versions of Windows, and image recovery from CompactFlash, SmartMedia, MultiMedia and Secure Digital cards. After scanning your disk, Glary Undelete will display a list of deleted files, along with an estimate of the probability of successfully restoring each file. Losing a file due to an accidental click or keystroke is bad enough. But losing your entire hard drive to a hardware failure, virus, flood or fire can be devastating. And no simple undelete utility will fix that. But backing up your hard drive will help in both the "Oops, I deleted a file" problem as well as the "Oh no... my hard drive died!" scenario. 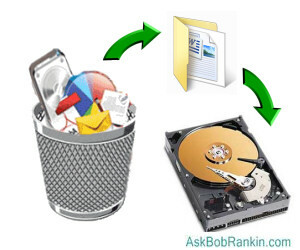 See my article Free Backup Software Options for tips on how to get the job done. Another popular free file recovery tool for Windows is Restoration. This program will find just about everything you've ever deleted from your PC, including files deleted from the DOS prompt. When the program starts, choose a source drive, then click the "Search Deleted Files" button. If you have a file on your hard drive with the same name, restore the file to a different folder, or flash disk so that your existing file is not wiped out. Restoration can also permanently delete files, making it almost impossible to restore or undelete them. Restoration has a no-frills user interface, but it's easy to use and does a good job. FreeUndelete has no charge for personal usage, although they charge for businesses. The program is spyware and adware free, works on Windows XP, Vista, Windows 7, and can restore files from your Recycle Bin or NTFS, FAT32 or FAT16 hard drives. Once recovered, they will be saved in a new user-selected location to prevent overwriting files. There are also free tools for other types of data disasters. Advanced PSD Repair (APSR) is handy for recovering Photoshop PSD and PDD files and works with all versions. And if you work with external media, Recovery Toolbox for CD Free can recover data from damaged or corrupted CD, DVD, HD-DVD and Blu-ray discs. The same company also makes a variety of other data recovery tools, including Recovery Toolbox for Outlook, Outlook Express, Word, Excel, Zip and other applications to recover damaged or deleted data. They're not free, but you can get a free trial to see if it'll do the job. Most recent comments on "Free Tools: Recover Deleted Files"
Is there a way to recover a deleted file from Dropbox? I have been sloppy about running backups on my system because I save important files to Dropbox. Then I have copies both on my desktop computer and iPhone. However, I must have accidentally deleted one of those files and didn't realize that for more than 30 days. By then it was no longer available to me from Dropbox. I know if I pay $10/month Dropbox gives me their "Packrat" feature with permanent retention of deleted files, but I would like to find a free alternative. Thanks. Wonderful article. I've known of, and used, several of these - but it never occurred to me that I needed to have he utility installed BEFORE the problem occurred, to minimize the chance of an overwrite during utility installation! Wow, I've been luck so far, but won't take that chance again! thanks bob, seven years ago i preserved my favorite music on DVD thinking that i would access it anytime later. when i tried to do that, many of the files could not be read and i could not access them. to get them again i would have to buy a tape recorder and a CD recorder, something i can not contemplate doing now. i have therefore taken a plunge on the recovery software you have today commented on and hopefully will get the results i have so long waited for. I clicked on the "Restoration" link which took me to download.com. I then clicked download, which included a Cnet installer. What a mistake! It installed all sorts of critters on my hd. And yes, I unchecked where I should have before install. I once accidentally re-formatted a drive that was formatted as a XFS to FAT32. After making a DD backup, I successfully restored all files using UFS Explorer. UFS works with just about any OS. Another great topic, Bob Rankin! What I am learning among my Windows-people is that most don't know the mechanics of LEFT-click 'drag-n-drop' style of copying files. In the Windows environment, if a file or set of files are dragged-n-dropped within the same hard-drive, they are normally MOVEd from one location/folder/directory to another. If the same action is performed between two (2) different physical drives, the resultant action is a COPY command. I try to instill in my Windows-people to use 'drag-n-drop' while utilizing the RIGHT-click of the mouse. In this manner, the WinOS gives the choice to the user whether the command will be a COPY or a MOVE command, with a drop-down menu. Another great article, Bob. I am so pleased to see, that Piriform and Glarysoft software companies are being solidly recommended. I personally, will attest to both of these software companies and to the solid proformance, of their software. Must admit, my favorite aspects to both of these companies, is being able to truly try out their programs, for free ... Which, I did for many, many years, until this year when I purchased the Pro versions. I got excellent years of good service with their free versions, but, decided to get their Pro versions, to save me some time and energy. Most times, the Pro versions, will do scheduling and updates automatically, as to doing everything manually. I didn't read through all the replies, but does anyone know of an undelete utility that will undelete folders? I was having some difficulties with an external hard disk, so I used the Error Checking function to check for and repair drive errors. It fixed the problems, but a multiple gigabyte sized folder "disappeared" in the process, and I need that back. I haven't made any changes to the drive since then, but can't find software that undeletes folders - or at least large folders. The software I've tried it with freezes, apparently - or presumably - because of the folder's large size. Don't caution me about giving out my email address - I get that a lot. This is my "garbage" account I've used for years that I give out freely on the internet, and use for nothing else. You have covered almost the information with this description. Few weeks ago, I have tried one tool “remo recover” to restore data from external drive. After employing this utility, I recovered all the files in few mouse clicks. Thanks for sharing the free tools. Personally, I had ever used the freeware Recuva and PhotoRec for recovering deleted files.